I’ll begin a thread, to follow along with my loooooong-awaited continuance of a 1966 Jeepster into a hot rod. For decades, I have wanted a hot rod, powered with a Jag 6: well, I hope I live long enough to see it move under its own power! Before you go to the trouble of removing the entire F.I. harness from the donor car, let me go through my boxes of spares. I’m 99% sure I have a complete harness sitting in a box…leftover from my own conversion project. If I do, I’d be happy to donate it to your project. be even better if its 4wd ? Have you considered aftermarket electronic control, I know one guy he is running an aftermarket computer with coil over plugs, cant remember about his fuel management system. My frst was a well used Willys pickup. The title said 51, the truck was 56 configuration??? Lumped with a 283 SBC. Climb like a goat. rear ratio not good on the freeway. screamed at 55!! I read the magazine zealously. 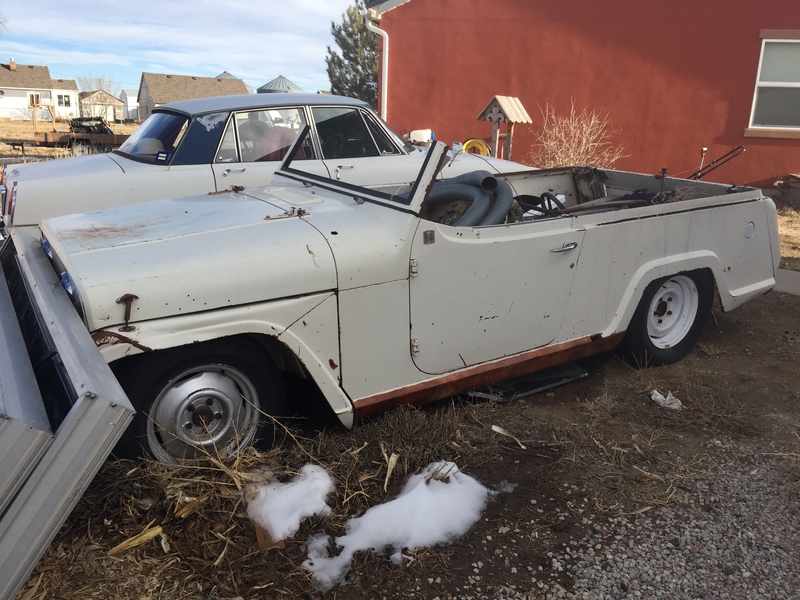 Several tales of adding 4 x under pinnings to Jeepsters. The later Jeepsters were 4x4s: the builder (a friend, who I helped design and build the chassis), slammed it and made it a Mustang II front end, 4-link/ coilover rear. When it gets nicer, I take a few photos of it. We might have to create a new category… we could call it “Jumps”. Decades ago, I and my dear departed delighted in flea markets. On one occasion, I came on a display by an independent Jaguar repair. Their shop truck, a vintage REA box repowered by an XK! Pete: whatever standard horseprrssure an SIII Jag makes will be puhlenty! Singular. Not sure anyone else will ever be so warp-ped as to do it again. One of the guys I went to school with spent a great deal of time talking about (but less actually figuring out how) making a Celicuar out of his '70s Celica. Ok. I feel better… a little. Post shortened. IE or internet issues. Railway Express Agency. A percussor, in a way of UPS and the like. But interacted with RR freight. Pickup and delivery to and from the RR freight dock. Mid forties Ford 1 ton or 3/4 ton. Delivered as bare from the cowl back. REA added a big wood box. Ford part in black, what else. the box I red and green with gold lettering. Classy rigs. this ne repainted and used the sides as a bill board for their shop. Flat head V8 gone., Jag six in place. . Yes, the Jeep is actually lower than the Rover! When spring rolls 'round, I’ll get the Jee-Type in the garage, and begin removing the Buick V6, and begin adapting the XJ. Thanks to DD–and anyone else who wants to chime in! !–I have ID’ed the relevant FI bits, and DD has generously donated (from another donor to the donee…) a wiring harness, which saved me the hassle of removing seats and chit. Surely, the donor is far rougher looking than the than the donee !! I see the point… Snow patch on the ground!! Nice Jeepster, even with mismatched wheels!! What went astray with the Buick V6?? Actually, the donor was pretty darn good shape: no major rust, all the exterior body panels were straight, and the interior was decent. Yep…I’m a wimp: I don’t do much outdoors, till April/May. What went astray with the Buick V6? Still there, even runs, but, I’ve never liked the engine that much, and this will satisfy my life-long Jones for an XK-powered hot rod. 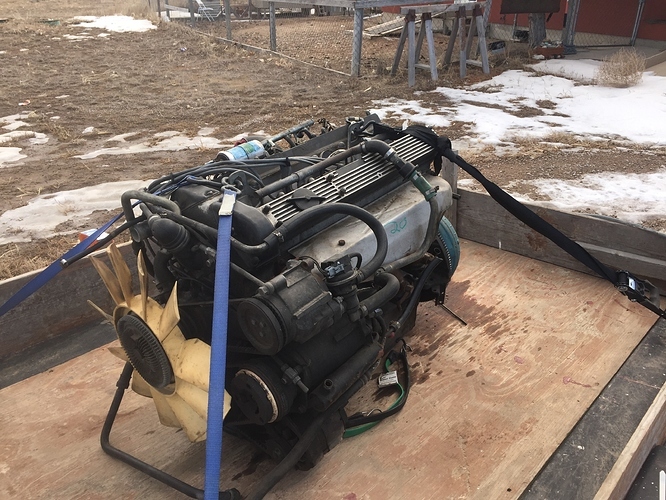 Weather was decent, today—first time above 50F for weeks!— so did a little componentry removal on the donor engine: Id never seen the clever little fuel cooler! Ill have the AC compressor, air pump, fan/ fan clutch, and a few other bits, up for grabs: PM me if you require them. For sure, that engine when “cleaned up” is impressive. DOHC’s are hard to beat in “looks” alone. But that FI is weird. the orientation of the throttle valve. that overly complex air flap. And the row of sensors along the water rail. Yeah, I was also surprised a the fuel cooler as well as the trans cooler. Impressed there. Especial the latter. Oh, add the oil cooler. Impressed there. I should have kept the latter and perhaps used it as a trans. Although my LT1 manages on it’s gear. No oil cooler. But, there is provision at the filter to add one. Is the DOHC too tall for the Jeep’s engine bay? And in conflict with the Mustang suspension? Nice Jeep should look good and drive good. (A) Is the DOHC too tall for the Jeep’s engine bay? (B) And in conflict with the Mustang suspension? (A) height: I think there will be clearance. (B) Not sure yet: two differing schemes, if so. Remove the oil pan and decrease its depth at the front, as much as possible, and/or move the engine back. That might entail opening up the transmission hole in the firewall, but that’s not a biggie to do. Going to use the stock manifolds, and gutted cat, into a single pipe, out the driver’s rocker panel. EDIT: Took a tape measure today , before “sa bluste kalte vind” began, and height isnt an issue: Ill likely have to modify both the oil pan, and the custom x-member, to make it so the engine will fit. The V6 is 24 inches long, and the Jag is 27 inches. I’ve got a spare one (locked up: anyone need a SIII head?) that I can fiddle with the pan, to help it clear the extant cross member. 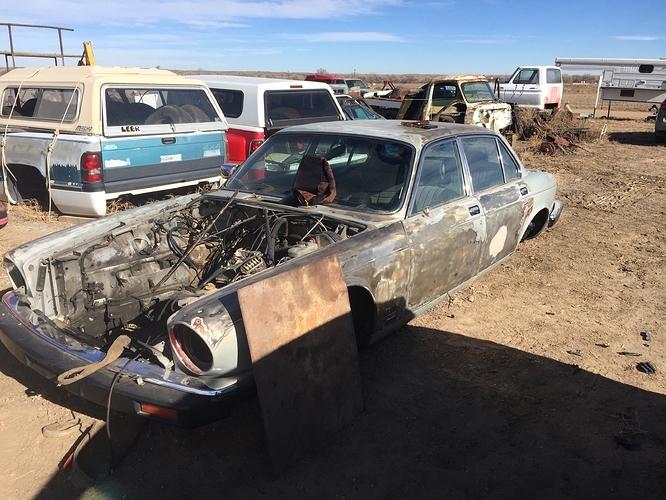 In about 6 to 8 weeks time, I can get the body off, the V6 out, then start trial-fitting the XK. I seem to remember the founder of Leduc Off-road used to race a keep with an XJ6 engine. It raced quite successfully in Massachusetts. Interesting project to watch but, at 70, I don’t think I’ll live long enough to see in finished.